Click here to see a fun, retro video about MacDonald’s Shamrock Shake posted on Serious Eats. Thanksgiving wouldn’t be the same without pumpkin pie. But that doesn’t mean you have to be boring — not at all. With the iSi Creative Whip, you can put a new spin on a classic to keep things interesting and fun during this year’s feast. So how about considering a creamy pumpkin pie mousse with pecan-gingersnap crumble? Once you mix together a base of five easy ingredients, you’re practically done! And for some added texture, a pecan-gingersnap crumble adds just the right amount of crunch so you’re not missing the crust. There’s no worrying about if your pie crust is cooked through or if it’ll be done on time. You can even take this “pie” on the road without worry. In a bowl, combine and mix together pumpkin puree, cream cheese, sugar, and pumpkin pie spice. Add heavy cream and mix until smooth. Pour into a 1 pint Creative Whip. Screw on one iSi cream charger and shake vigorously. Chill for at least one hour before serving. Preheat oven to 350F. In a food processor, blend together gingersnap cookies and pecans until finely chopped. 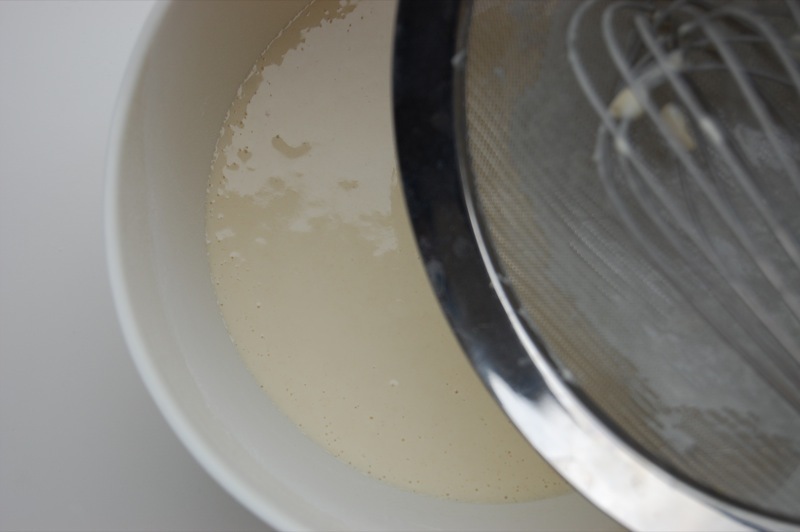 Transfer mixture to a bowl and mix in sugar. Add melted butter and mix until combined. Spread mixture out evenly onto a sheet pan and bake for 10 minutes. Allow to cool before breaking into a rough crumble. Dispense pumpkin pie mousse into individual bowls or cups and garnish with pecan-gingersnap crumble. Alternatively, layer pecan-gingersnap crumble between layers of pumpkin mousse for a layered effect. Serve immediately. *Note: Other natural sweeteners, artificial sweeteners, flavored syrups or liqueurs can used as an alternative. Just make sure the sweetener is completely dissolved before charging. Mix coffee with half the cream and refrigerate for at least six hours or overnight. In a microwave-safe bowl, warm remaining cream and milk until hot but not boiling. Add chopped white chocolate and stir to melt. If needed, heat mixture for a few additional seconds in the microwave until all the chocolate is melted. Add coffee-infused cream, Creme de Cacao to taste, and stain through a fine mesh sieve. Pour into a 1 pint iSi Creative Whip and chill for at least 2 hours. Screw on one iSi cream charger and shake vigorously before serving. In Japan, tempura masters train as apprentices for years before they’re allowed to make the batter, much less dip and fry the freshest ingredients until they’re golden and crisp. The trick to great tempura is keeping the batter chilled and carbonated, both which create a final dish that’s delicate, crisp, and not doughy. With your iSi Creative Whip, you’ll make tempura like a master in no time. Tip: Use fine sea salt which dissolves more quickly. Rice flour (found in Asian supermarkets) produces an even crunchier bite but all-purpose flour works just fine too. Replace part or all the water with vodka which evaporates even faster in the hot oil, producing an even crunchier crust. Pour water into a large bowl. 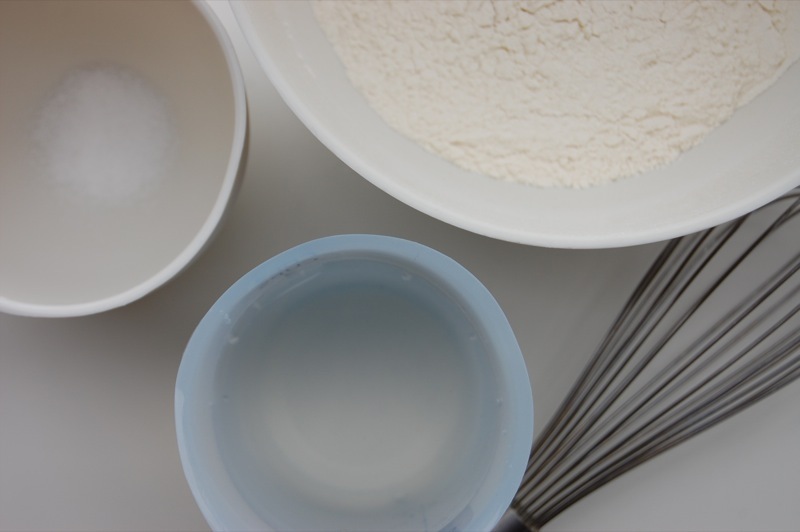 In another bowl whisk together flour and salt. 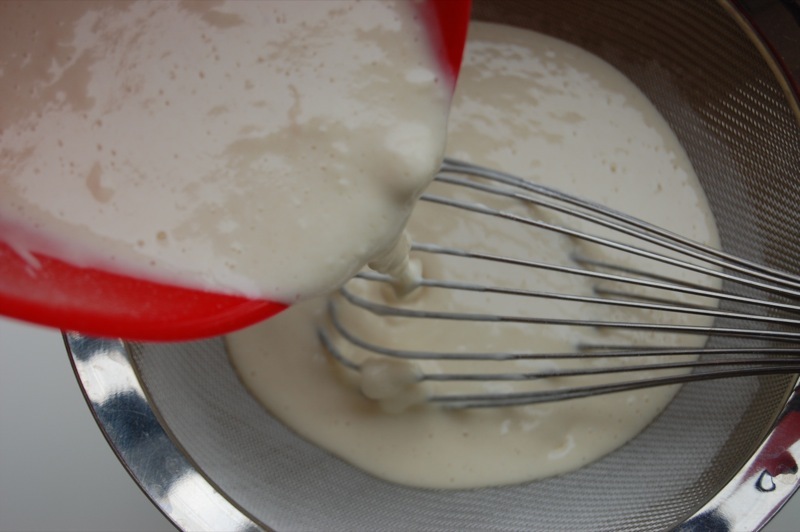 Sprinkle flour mixture over water then barely whisk the batter. There will be lumps. Pour the smooth batter into your iSi Creative Whip. 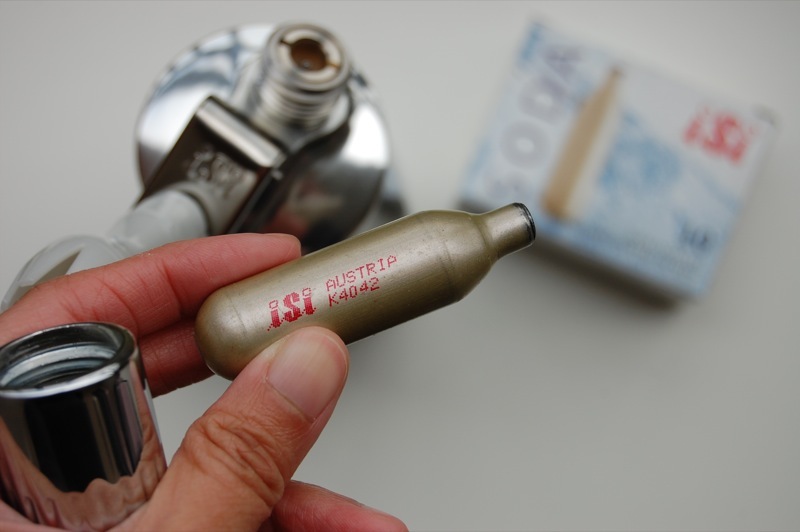 Screw on one iSi soda charger– not the silver cream charger – but a gold soda charger. Shake vigorously about 5 times. Test your batter. It should look like fizzy, soft whipped cream. Dip lightly floured pieces of seafood, veggies – like the green beans in the photo above – or seasonal wild mushrooms immediately or you can let the batter chill in your fridge until you’re ready to fry. To serve, preheat oil to 375°F and fry battered pieces until light golden. Sprinkle with salt while still hot and serve immediately with or without a dipping sauce. Your finished tempura dishes will be light and crisp enough to challenge even a tempura master chef! Try this easy maple whipped cream on pumpkin pie, morning pancakes and waffles, or as deliciously melting treat on hot oatmeal. 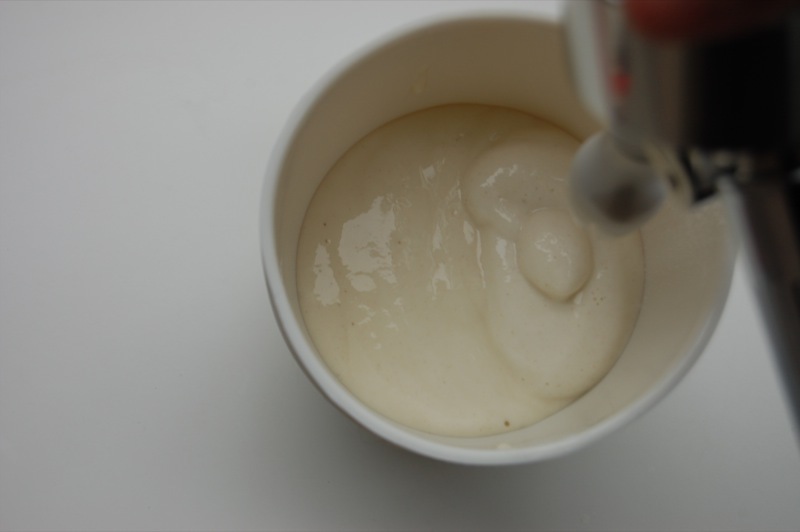 Pour cream and maple syrup in a 1 pint iSi Creative Whip. Screw on one iSi cream charge and shake 3 to 5 times until desired consistency is reached. Serve immediately or store up to 10 days in the refrigerator. *Note: Any flavored syrup, sweetened to taste, can be substituted.